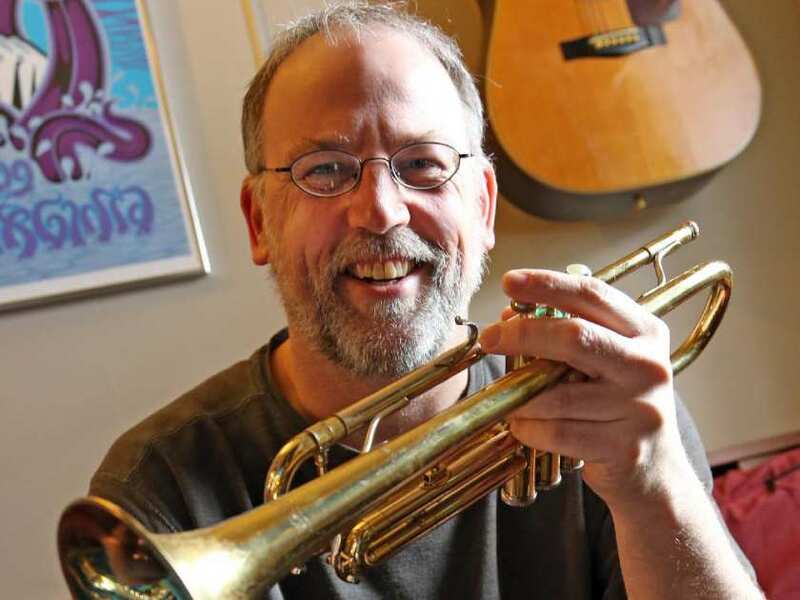 Visit the Ottawa Citizen website to read Lynn Saxberg's article promoting the Instruments For Africa Benefit Concert and Silent Auction at Irene's. 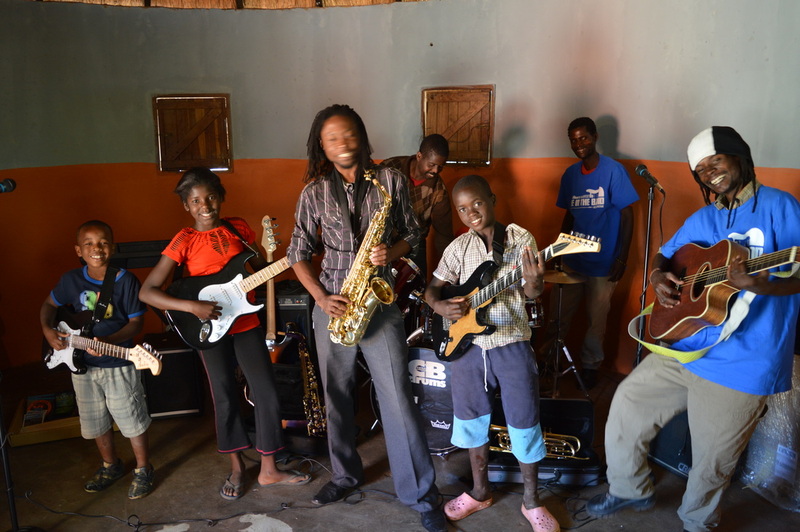 Click here to read an Ottawa Citizen article on the May 2014 launch of the RBC Bluesfest Be In The Band program in Lusaka, Zambia. Click here to watch a documentary on IFA's first instrument delivery through Zambia. The documentary was produced by Zambia's Ministry of Education and is in two parts. Instruments For Africa announces their partnership with RBC Bluesfest's Be In The Band program on CBC Television. Click here to watch the story by Waubgeshig Rice. Instruments For Africa Hits Right Note. Once again IFA is honoured with a feature in the Ottawa Citizen's Upbeat section. Ottawa neighborhood papers ran a story on IFA's successful trip to Zambia. Click here to read the piece in EMC. 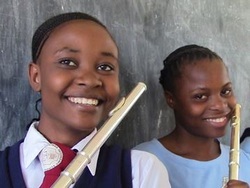 British instrument manufacturer Beaumont donated some flutes to IFA and shipped them straight to Zambia on our behalf. 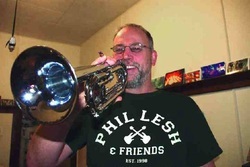 Click here to read an interview with IFA's Todd Snelgrove from the Windspiration section of the Beaumont Music website. Click here for a short article on IFA that appeared in one of Zambia's biggest national newspapers, the Post. Click here to read about IFA's instrument drive in Cornwall, Ontario from the Cornwall Standard Freeholder. IFA is now collecting instruments in Cornwall, Ontario and The Cornwall Daily was there to pick up the story. 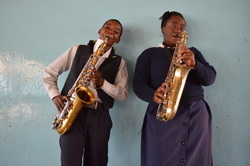 Click here to watch a feature on Instruments For Africa from CBC Ottawa. The Ottawa Citizen sent a reporter to talk to Todd Snelgrove about about IFA's upcoming benefit concert on March 9 at The Rainbow. CTV's Regional Contact shot a feature on Instruments For Africa. You can watch it here. Metro Ottawa, March 4, 2013. Todd Snelgrove, a music teacher for almost 20 years, went to Zambia in May 2012 hoping to give away a guitar donated by the Ottawa Folklore Centre. On the trip, Snelgrove learned of a school that didn't have any musical instruments. The headmaster enthusiastically invited Snelgrove to come and present the guitar and play some jazz and blues for the students. “Easily the most spine-tingling performance I have ever put on,” Snelgrove says. It was a Bob Marley song that stole the show, though. Back at home, Snelgrove put out the call for a full set of orchestra instruments for the school and so far has received 100 instruments that will be used to equip not just one but three schools. In the spring, he will travel back to Zambia with the instruments. 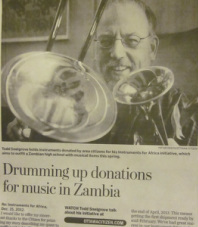 To donate instruments, and for information about a benefit concert on March 9, go to instrumentsforafrica.com. Instruments For Africa has the featured letter in the Ottawa Citizen. Todd Snelgrove introduces the Instruments for Africa initiative in this article from the Ottawa Citizen.